Zhengzhou Camelway Machinery manufacture has twelve specialized equipment production lines; the main products include tower cranes, construction elevators, concrete mixing stations, JS concrete mixers, concrete batching machines, stabilized soil mixing stations, wheel loaders, concrete transport tanks, JZC concrete mixers and other construction machinery, with a total of 100 models divided into eight series, covering almost all types of construction machinery and equipment needed for building construction. 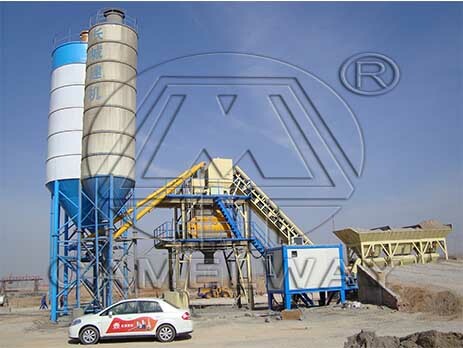 Then we will introduce the HZS90 Concrete Mixing Station to you. The specifying on cement tank of HZS90 concrete mixing station : For HZS90 concrete mixing station, its cement tank is bulky and heavy. Cement tank component of 6t, having a diameter of 3.3m, high 12m, apparatus height is 5.8m. In accordance with the conditions of the construction site, it need use a 25t crane device a 50 loader cement tank. When the crane boom height 20.5m, work and downs of 8m, lifting capacity is 7.85t. 50 loader lift capacity is 5t. When construction, finish debugging cranes and transport equipment. If you want to know more information about the equipment or buy it, you can contact us. This entry was posted in Solution and tagged HZS90 by camelway. Bookmark the permalink.